In its September 2018 meeting, the DART Board of Commissioners agreed to collect feedback on DART’s priorities for the 2019 legislative session from leadership in their communities. 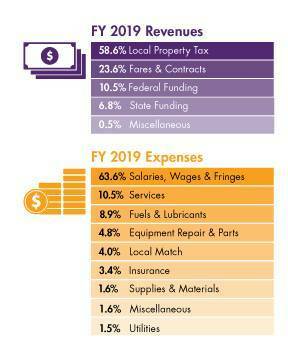 One priority being considered is an increase in the property tax cap for Regional Transportation District’s (RTD’s). DART is currently the only RTD in the state of Iowa. A list of commonly asked questions about DART’s funding and legislative priorities is available below. The Commission may vote on these legislative priorities at its Oct. 2, 2018 meeting. How is DART currently funded? DART’s operating revenue is comprised of several funding sources, pictured to the right. While the average public transit system sees approximately 20 percent of its revenue coming from fares and partnerships, for DART that number is well above the average at 25 percent. How does the property tax levy work? The DART Commission only has the authority from the Iowa Legislature to collect a maximum of 95 cents per $1,000 of taxable valuation from residents and commercial taxpayers in its member communities. The levy rate varies by city and is set each year by the Commission as part of the budgeting process. Based on a regional formula, when a levy increase has been approved, each community’s levy increases by the same number of pennies. Several DART member communities are at or nearing the $0.95 cap. As a result, any future levy increases will fall increasingly to the communities with the remaining capacity. Last year, on average a $200,000 home paid $73 in property taxes to DART. Why does DART need additional revenue? DART’s annual operating cost increases of approximately 3% are higher than the increases with property tax revenue, as well as state and federal funding. In order to maintain existing service levels, the Commission will have to consider increases to the levy as we look to the future. Projections show that even if all communities reach the cap, DART will have a funding shortfall in 2026 and would be forced to cut service if additional funding is not available. If additional increases to the levy are needed, communities already at the cap will not continue to fund DART in the same proportion they do today. How does the region’s spending on public transportation compare to other cities? The current annual spending per capita for public transportation in Greater Des Moines is $47, which is far lower than other comparable regions such as Nashville ($87 per year) and Indianapolis ($79 per year). Is DART making the best use of its existing resources? Is DART pursuing other funding, outside of raising the property tax cap? DART has and continues to be very focused on securing new revenue opportunities in order to minimize the need for property tax increases to maintain the existing system. Private and public partnerships with businesses and organizations. In fiscal year 2018, more than $1.4 million in revenue was a result of partnerships with businesses and community organizations. Long-term, the DART Commission will continue to evaluate if other funding sources should be considered in order to supplement or replace property tax revenues for DART. What changes are being considering to address long-term public transportation funding? The DART Commission is considering a request of the state legislature to increase the property tax cap for RTD’s from $0.95 to $1.95. This increase would provide enough capacity to sustain DART’s existing service levels through 2040, as well as provide the Commission with flexibility to entertain other property tax formula options and permit some level of growth to meet potential future needs. Why is the DART Commission pursuing changes to the property tax cap instead of other funding sources? After careful consideration of all funding options, the Commission has decided to pursue an increase in the property tax cap as it is considered to be one of the more feasible methods for securing additional revenue in the next few years. If the legislature approves the property tax cap increase, will there be an immediate impact on property tax levies? An increase in the cap will not result in immediate drastic increases in the DART property tax levy. The Commission will continue to review and consider any property tax levy increases as part of its annual budgeting process. Furthermore, if additional increases to the levy are needed, having additional capacity will allow for all communities to continue to fund DART in the same proportion that they do today. Why is the DART Commission considering a request to increase the property tax cap now? Based on DART’s financial modeling, we know that there will be a shortfall due to the lack of capacity in the levy and that it may take several years for a legislative proposal to be acted upon. DART is being prudent in starting the discussion now before it becomes a crisis. Does the DART Commission or staff have plans to expand public transportation services? Not at this time. The Commission’s priority has been to ensure existing public transportation services are as efficient and effective as possible and that there is long-term funding to sustain these services. The Commission will continue to work with DART staff, community partners and the public to evaluate how public transportation should evolve and grow alongside the region. Does DART have any other legislative priorities, besides increasing the property tax cap? A legislative fix for current Medicaid funding challenges. Specifically, DART wishes to ensure the cost of transportation for trips previously funded by Medicaid should continue to be funded at the full cost of the trip and not be transferred to other programs subsidized by local property taxpayers. Maintaining the property tax backfill at current levels. If this should be eliminated, as some legislators propose, DART would have a loss of revenue of more than $600,000 per year.